Hosting a hackathon bus ride to the Game Developers Conference in Los Angeles helped TapSense connect with elite independent game developers and engineers. TapSense is a software platform that powers advertising in apps. 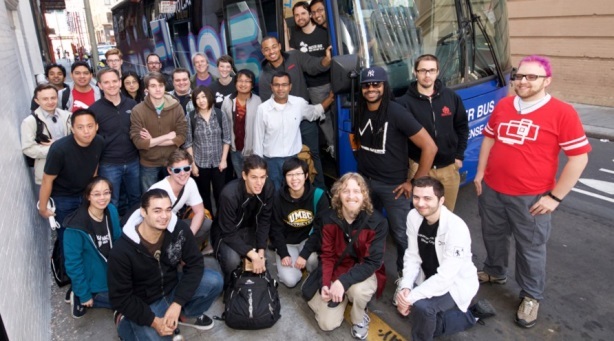 Hosting a hackathon during a round-trip bus ride from San Francisco to the Game Developers Conference (GDC) in Los Angeles last November helped the company connect with elite independent game developers and engineers. "App developers and engineers are extremely challenging to reach," says Gregory Kennedy, SVP of marketing for TapSense. "Social networking, word-of-mouth, and events are the things that resonate with them. Hackathons are popular strategies, and we put a creative spin on that by hosting the world’s first mobile hackathon." Game developers were invited to submit portfolios of their work to be chosen to ride on the bus. During the trip they would create a game incorporating TapSense’s platform. The creator of the best overall game won $10,000 in ad spend on TapSense’s platform to promote the game. "The hackathon was a form of sampling," Kennedy explains. "The goal was to generate awareness and engage the highest-quality app developers we could. The bus itself provided a great branding opportunity because we could wrap it in branded graphics." Partnerships with AT&T and Nvidia lent credibility to the effort and helped drive awareness. The hackathon was promoted through a three-month Twitter effort beginning in August that included giving away small prizes, such as coffee shop gift cards, to people who posted a link to the hackathon sign-up page with the GDC hashtag #GDCNext. Trade outlets were pitched beginning in August, and a reporter from Pocket Gamer rode on the bus. "Our sponsorships with AT&T, Nvidia, and the nonprofit organization Women Who Code came through word of mouth," Kennedy says. "We emailed Women Who Code members, and AT&T and Nvidia promoted the campaign on their owned channels." The campaign was also promoted to 25 different Meetup.com hacker groups; during TechCrunch’s Disrupt conference held in San Francisco in early September; in about 100 co-working spaces in San Francisco, such as RocketSpace; and via email blasts. Thirty-five developers out of 163 who signed up were selected to ride on the bus (November 2-5). The remaining developers created apps remotely. A former Zynga developer won the contest. "TapSense software will power the advertising for the winner’s app," Kennedy explains. "We expect the winning app’s inventory, which is the amount of space we get to sell, to generate significant revenue for TapSense. Plus we can use the app as a case study to drive community thought leadership, which is huge for us. "Reaching 163 developers, many high level, is really hard to do, and we’re very pleased," Kennedy continues. "The quality of the leads was much more important to us than the scale. That the contest winner was a top iOS mobile developer for Zynga is the ultimate outcome." The campaign got 221 Twitter mentions (estimated audience reach of 9,351). Reach though Meetup.com was 82,260. Three earned stories ran in trade outlets. TapSense is preparing for two trade events in March – the World Mobile Congress in Spain and another GDC event in San Francisco.